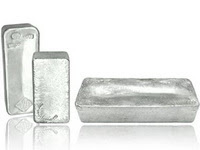 Buy Palladium: Gold, Silver, Platinum, or Palladium? Are you looking to invest in the precious metals market? You've already made a great choice for investing your money! Now, what type of coin or bullion do you want to buy? Gold and silver are the obvious choices. Gold is your safe bet, and you have silver which is more volatile. But then you have platinum and palladium. Both silver in color, and just or even more volatile. 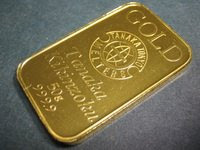 If you want an investment that will move up and down slowly, then you should choose gold. If you want something more volatile that in the past few months has lost nearly half of its value, you want silver or maybe even platinum. If you want something volatile, rare, mysterious, at the bottom of its price range, and with the highest chance to double, or even triple, you want palladium. We've watched gold and even more silver and platinum fall in the past few months. I don't think any of the four main investment metals--gold, silver, platinum, palladium--will lose much more than 5% of their current values. Gold, if it rises to where it was, will go back to $1000 an ounce, a 25% gain. If platinum, palladium, and silver return to what they were a few months ago, you get a 45% gain. However, palladium has been over $1000 per oz before. I personally don't think it will go that high again anytime soon, but if you figure it the same way I figured the rest, you'd be at 75%, meaning it will gain 75% of its old $1000/oz value (or rise 400%). Any of the four are sound investments, as they are all as low as they will be for now. But, how much do you want to make off of your investment? Gold: was at $1000 oz (over $30 per gram). It went down below $750, and is up around $830 or so today. Now, if gold returns to $1000 an ounce, are you going to make a killing? Not exactly. Silver: was at $22 a ounce. Now it's down to $12, and was even around $10.80 for a while. Does this have a chance to double? Absolutely. Platinum: was at $2200 and ounce and is at $1100. You don't need me to tell you it's on sale. Get it while it's cheap! 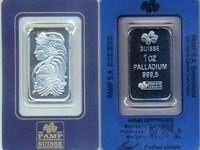 Palladium: fell from $550 to it's low of $230 today. That's over a 50% drop! Now, does this have potential or what? Remember, it is the only metal that had ever reached FOUR TIMES of its current value. 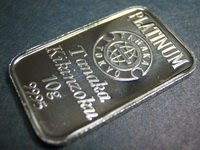 With palladium you get the best of both worlds: Likely to double like silver and platinum, but also the chance to increase to 4 times its value. I'll take some! me too...i like it. I like silver more at 23.90 in Oct 2010, but I need to diversify, and you were right - i gotta pay spot at $630 + commission!! !